If you run your RepRap on a resonant surface such as a table, you may notice a strange thumping noise. That noise is your neighbours in the flat below banging on their ceiling with a broom-handle. You can murder your neighbours, dismember them, and distribute their remains in sealed plastic bags round the wastebins of the nearest large city. The first option is the recommended one. 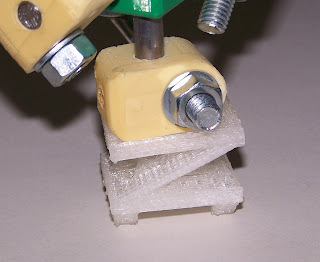 These spring feet decouple the mass of the RepRap machine from whatever it is resting on. That considerably reduces the transmission of the vibrations from the machine. Details and file downloads are here on Thingiverse. I added something to prevent vibration to my repstrap Darwin build for the same reason here is a link for those who cant print dancing shoes yet.